In June and July, female nursery web spiders can be seen carrying their egg sacs in their jaws. 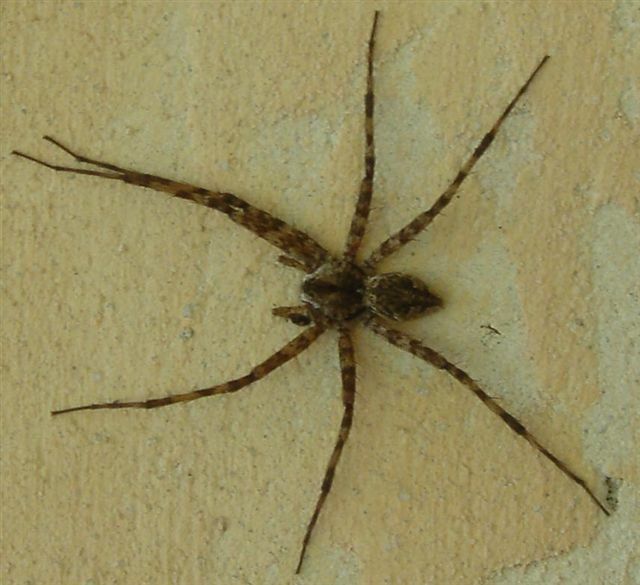 Female nursery web spiders are 12-15mm long and males are 10-13mm. They are grey, yellowish-orange or brown with a pointed abdomen. They tend to sit with their front two pairs of legs together and their rear two pairs of legs together, giving the appearance of having only four legs. Nursery web spiders predominantly inhabit woodland, but they are also found in long grass and occasionally hedgerows. On colder days these spiders will often come into houses to escape the harsh weather. They hunt small insects and occasionally other spiders. Nursery web spiders do not use webs to trap prey. Instead they hunt by waiting on a leaf until a victim wanders by. In an effort to make mating less hazardous, the male will catch an insect, wrap it up and carry it around until he finds a female. He then presents it to her and mates with the female while she is distracted by her meal. This lasts for about an hour or until the female has finished eating her gift. 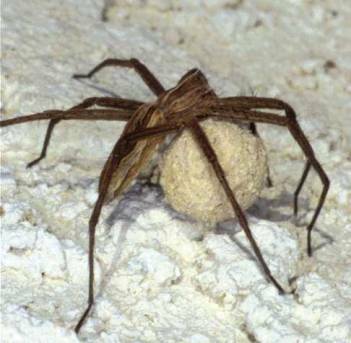 The female will make an egg sac and will carry it around with her in her jaws until the eggs are nearly ready to hatch. She then constructs a tent-like protective nursery web and will stay to fend off predators from her young.